Boost engagement Facebook Graph Search seems to be just the shot in the arm Facebook needs to get people to participate in brand pages. Your old content will seem new again as it comes up in the new-and-improved search (so be sure you're using descriptive captions and locations on your photos). Get more Likes If you search for "My friends who like _________," it'll show you the other things they Like in the search results. This is a great discovery tool to help people find new Pages to Like. 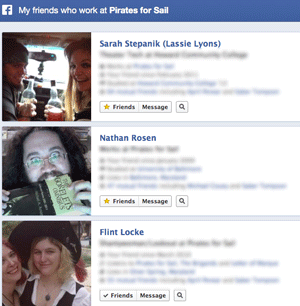 Recruit great new hires Facebook Graph Search enables employers to start finding people with skill sets they're seeking AND who already "Like" their company. Donor intelligence Doing focus groups and surveys takes time and effort. Facebook can help you find what people who Like your brand also Like, to help you to make better connections in your communications and at your events. Want to take advantage of Graph Search? Here are 8 steps to optimize your Page.